Wallpaper – It's Not Just for Walls! Wallpaper – it’s "in", or it’s "out", but most recently it’s been "in". Businesses, designers and homeowners have all embraced the resurgence of wallpaper and there’s lots of beautiful, modern designs out there right now to fit every taste. But of course trends are always changing, and we love that traditional wallpaper has been able to remained current in the design world by being used in nontraditional ways! Looking to add some pizazz to your home to increase curb appeal? Want to impress visitors to your home with minimal investment and effort? 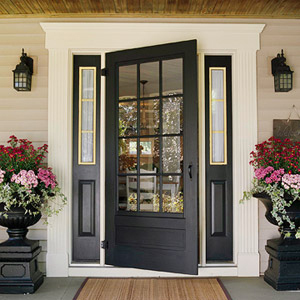 Repainting your front door can be a quick and easy project with big payoff in the appearance of your home.